The Templates Area is the library for storing, creating and managing the templates used for creating BrightWork sites. Templates enable the reuse of best practice and the capture of previous project experience. 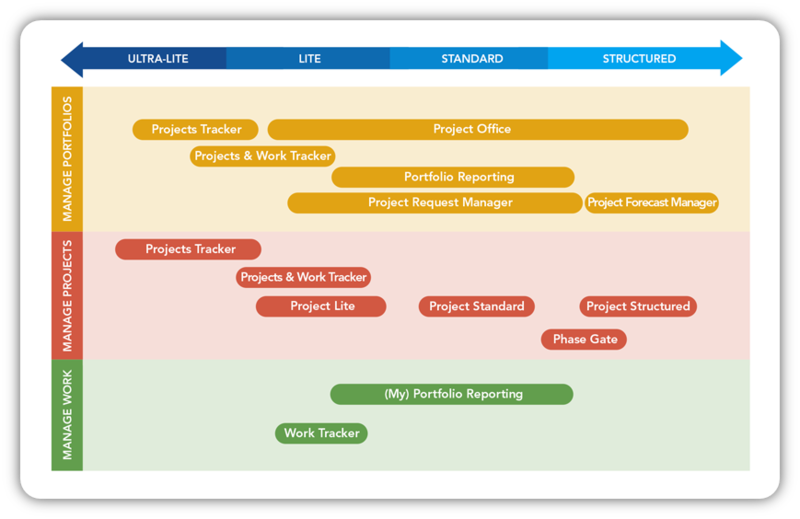 BrightWork is supplied with number of templates of varying complexity, for managing both single and multiple projects. You select the template you need based on the degree of project management process and structure that you require. Some templates must be downloaded from BrightWork Self Help Options. Please contact support for information on getting access to these templates. Templates can be created from project sites, or other templates, and are an essential tool in maximizing the efficiencies and cost-savings afforded by BrightWork. They allow you to reuse a successful project site so that both you and your fellow BrightWork users will be familiar with it and to harness lessons learnt. Templates and project sites are quite similar in appearance and functionality, except that you should not manage projects in the Templates Area. All templates are highly customizable and customizing templates is done in the same way as customization of projects. The Templates Area includes a report that displays information about the available templates. Note: Please see the BrightWork Templates Guide for the most up-to-date list and descriptions of the templates. Detailed Template training is available. Please contact support for more information.